From the authors of the New York Times bestseller 21 Pounds in 21 Days comes an effective thirty-day program to detox your body, achieve your weight loss goals, and improve your health for life. Roni DeLuz and James Hester took the country by storm with their instant runaway bestseller 21 Pounds in 21 Days, based on Roni’s unique and renowned detox program at the Martha’s Vineyard Holistic Retreat. With help from the feedback of thousands of detoxers, they have made the plan even simpler, more practical, and more effective. Now everyone can experience the rejuvenating, restorative, energizing effects of a cleansing detox one day at a time. The 1 Pound a Day diet detox will introduce you to a world of delectable and health-boosting clean foods. You will become a juice master with fresh, nourishing recipes such as Power Punch Green Juice and Carrot and Ginger Juice. You will enjoy satisfying, easy-to-make soups each night— Sweet Parsnip Soup, “Stir-Fry” Broccoli Soup, and Curried Vegetable Soup, to name just a few. Stories and tips from successful detoxers will inspire you and let you know what to expect every step of the way. Best of all, 1 Pound a Day goes beyond the twenty-one-day detox and weight loss period to give you guidelines for a nine-day transition back to everyday eating, plus strategies for keeping the weight off for a lifetime. Not only will you feel fantastic, you will be nourished from the inside out, making you look lean and radiant. To help you maintain the detox glow, inside you’ll also find two weeks of meal plans and luscious recipes from Roni’s kitchen. 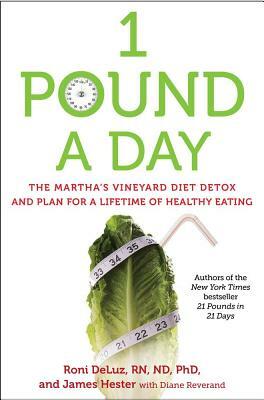 The 1 Pound a Day detox is the start of a lifetime of wellness. Your improved outlook, boundless energy, and optimal health will make it easy to maintain the changes you have made. Detox your body and regain your life! Toxins and noxious substances are everywhere you turn. This avalanche of chemicals accumulates in your cells, overwhelms your body, and disrupts its normal functions. The latest research points to “obesogens”—toxins that are stored in fat cells—as a significant part of the problem. If you want to lose weight and protect yourself from disease, 1 Pound a Day will help you lower your toxic load. Do you want people to say, “You look great! What have you done?” Then the 1 Pound a Day diet detox is for you! If you answer yes to any of the questions below, it’s time to make detoxing a priority. Do you . . .
Have a hard time losing weight and keeping it off? Carry weight around your middle? Eat a lot of processed food? Have a high level of stress in your life? Lose energy or get tired during the day? Let Roni help you lighten up, supercharge your energy, and look radiant! Roni DeLuz, RN, ND, PhD, founded the Martha’s Vineyard Holistic Retreat in 1997 to help others discover the path to wellness that she herself achieved after years of debilitating chronic illness. She has a PhD in natural health and a certificate as a naturopathic doctor from Clayton College of Natural Health/American Holistic College of Nutrition. She is a registered nurse and hydrotherapist and is recognized as a leading expert in the field of holistic health. She lives in Vineyard Haven, Massachusetts. James Hester spent years working as a record company executive before a health crisis led him to Roni DeLuz’s retreat. She helped him to lose more than forty pounds and turned his life around. He became so committed to her work that they became business partners in 2003. Their partnership resulted in the New York Times bestseller 21 Pounds in 21 Days. He lives in New York and Martha’s Vineyard.